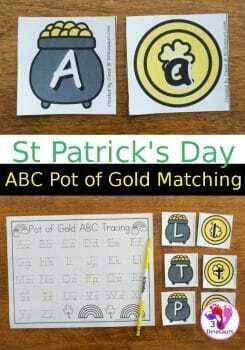 Practice both upper and lowercase letters for St. Patrick’s Day with this Pot of Gold Letter Matching Activity! This is a great activity from 3 Dinosaurs, suited for young learners, and you can laminate the cards to reuse over and over. Uppercase letters are printed on pots of gold, and the lowercase letters are printed on gold coins. Your child will need to find the matching pairs of letters! Check out our other St. Patrick’s Day resources here! Get this Pot of Gold Letter Matching Activity!